1. Take 550 grams chicken breast and cut it into pieces. 2. Transfer this into a bowl, add 1 teaspoon salt, 1 teaspoon red chili, 30 milliliters lemon juice and mix it well. 3. Marinate for 10 minutes. 4. Take a pan, add 2 tablespoons cumin, 1 tablespoon mustard seeds, 1 tablespoon sesame seeds and dry roast for 3 - 5 minutes on medium heat or until it turns golden brown in color. 5. Transfer this into a blender and blend well. Keep aside. 6. 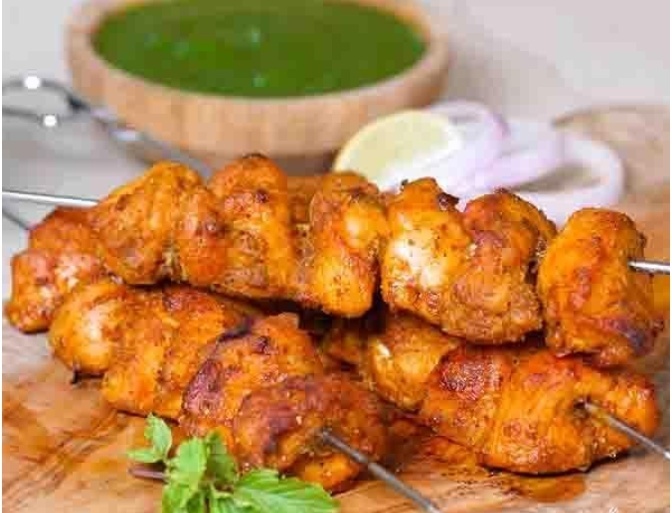 In a bowl, add 100 grams yogurt, 1 1/2 tablespoons ginger garlic paste, 2 teaspoons green chili paste, 2 teaspoons blended powder, 2 teaspoons tandoori masala, 2 teaspoons coriander powder, 2 teaspoons oil and mix it well. 7. Pour this mixture into the marinated chicken and mix it well. 8. Refrigerate for 1 hour. 9. Soak skewers in water for 30 minutes. 11. Place it on a baking tray. 12. Preheat the oven to 350°F/180°C. Bake for 20 minutes. 1. In a blender, add 15 grams coriander, 12 grams mint, 1 tablespoon ginger, 1 tablespoon green chili, 1/2 teaspoon salt, 1/2 teaspoon cumin powder, 30 milliliters lemon juice, 30 milliliters water and blend it into a paste. 2. Squeeze a lemon over the chicken. 3. Serve hot with prepared chutney.